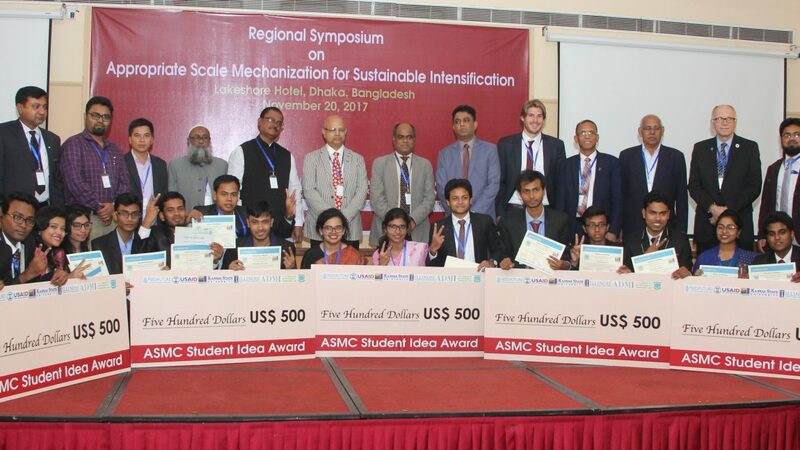 In November 2017, ADMI co-sponsored the 2017 Appropriate Scale Mechanization Consortium (ASMC) Symposium in Bangladesh, providing funds to support prizes for students that submitted the best ideas for improving agriculture in Bangladesh. 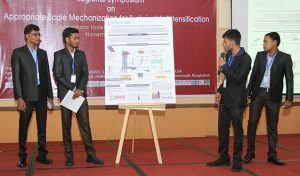 Students from seven Bangladeshi universities submitted more than 60 research proposals, and five teams were chosen to receive awards. The goal of the competition was to encourage innovation and entrepreneurship related to agricultural technologies. Ideas in the winning proposals included smartphone apps for agricultural trade and technology, monitoring systems for marketing, and sustainable agricultural business models, all of which hold potential to enhance market coordination or market efficiencies in ways that can reduce postharvest losses. The winning proposal for a zig-zag mechanical dryer represented further adaptation of the STR dryer used in the ADMI grain handling system. The winning team is pictured above presenting their concept. The top five teams each received a prize of 40,000 Taka and more importantly received feedback from researchers and professionals for taking their ideas to the next level. ACI Motors, another sponsor of the symposium, offered to fund and provide guidance to any of the winning teams as they seek to develop their concepts further. The ASMC is a subaward of the Feed the Future Sustainable Intensification Innovation Lab (SIIL), and is led by the University of Illinois at Urbana-Champaign, with support from ADMI.